Boat is located in Tampa,FL.Please contact the owner @ 813-465-0877..Sea Pro built this late model center console with a deep V and allowing for shallow draft, giving the owner ability to fish in the shallows or venture out into the Gulf. 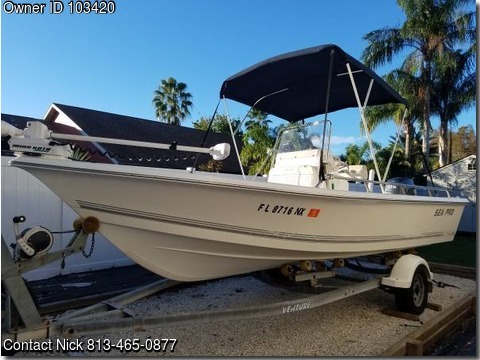 This boat with its sleek lines comes fully equipped for a day fishing but also includes a full cushion package that will allow to take the family to the favorite island for a day of fun. She is powered by a Yamaha 115 4stroke. This Sea Pro features: stainless steel hardware, trim tabs,Garmin Fish finder/ GPS, Compass, Minn Kota Rip Tide 24vTrolling motor with I-pilot and remote and dual battery as well as another dual battery setup with switch, 6 FT Power Pole, Huge cooler, on board charger, 2 separate live-wells, Rod storage, Large fish box/storage in bow, Anchor Box, Dual tackle cabinets, Bimini. She is powered by a Yamaha 115 4-stroke with only 650 hours. Routine maintenance every season. 100 hour service completed this October. Love this motor- purrs like a kitten.